And why then on the memory card of the control panel to record luac files? Or it is not necessary. I’m not sure I understand your question but anyway you can flag the luac option it will not do any harm. Thank you very much Alex. I will try now. Firmware for the receiver and transmitter normal or flex have meaning for the work of telemetry? 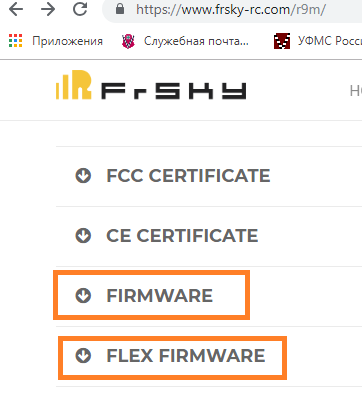 normal and flex both have telemetry, flex has power control also for EU 868Mhz. Installed on the openTX 2.2.3 remot control. The R9M transmitter module and the R9 Slim + receiver updated to the latest firmware FW_Ranger9_TX_20190117 and FW_Ranger9_RX_20190201, respectively. The problem did not disappear. Also, from the receiver R9 Slim + 2 messages come to the remot control and that’s it. But it is necessary to disconnect from the receiver and turn on the power for one second messages begin to arrive and the telemetry starts to work normally. I took the receiver from a friend, the same problem with it. But there are no problems with X8R and XSR receivers, they work flawlessly and transmit telemetry perfectly. What else can you do to fix the problem. Maybe some kind of log file with the information you send? I took the receiver from a friend, the same problem with it. But there are no problems with X8R and XSR receivers, they work flawlessly and transmit telemetry perfectly. What else can you do to fix the problem. Maybe some kind of log file with the information you send? I’m afraid there’s not much I can do. Your problem seems related to your specific R9 setup. Thanks for the support for to independent batteries with extended voltage range (above 51.2V). My platform uses an 12 cells baterry reaching 53 volts. Fantastic script - well done!!! 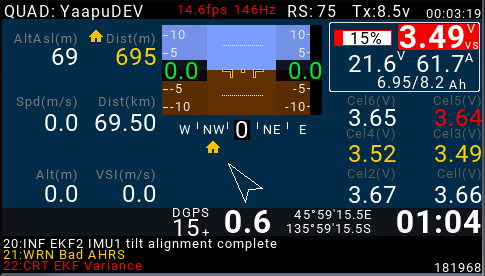 Where can I find a full table of all sensors available for the extra screen? One more issue, I was thinking to replace the Taranis’s internal RF module with an external longer range one. 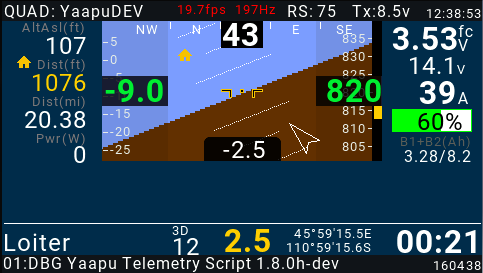 Hi, there’s no such thing as a table of extra sensors, the sensor you can view in the custom screen version of my script are sensors that you must already have as frsky telemetry sensors in your radio’s telemetry page. These are not provided by my script but rather by real physical sensors chained on the s.port bus. I agree with the answers you had on github, since you’re willing to dedicate a downlink to a serial one-way link for passthrough telemetry I’d rather bring a one way mavlink stream to the ground and convert it there to passthrough by using the mavlinkToPassthru firmware. Keep in mind that to respect frsky timing the link would have to be at 57600 bauds whereas if you use mavlink you can lower the serial speed down to whatever you feel resonable to respect your latency and above all range requirements! Hi Alex. Having spent several days in experiments, I came to an unequivocal conclusion. Using the P9M transmitter and the P9 Slim + telemetry receiver, it is possible to pause for 15 seconds after turning on the transmitter and then turn on the receiver. 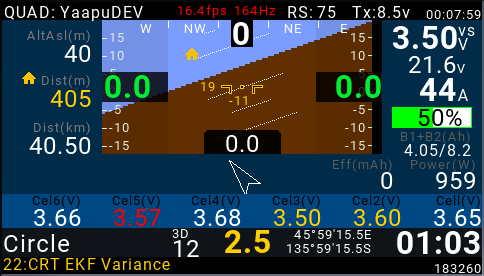 I did not manage to get other successful options to work with telemetry. Note: In order to prevent unwanted switch to the extra screen I changed the way to reach it. From the main screen press [PLUS] to display messages, from the messages screen press [ENTER] to enter the extra screen. This was designed with gas suite users in mind, it’s possible to define multipliers, labels, warning and critical levels in the conf file. There’s also the option to define lookup tables, when a sensor value is found in the lookup table the script shows that value instead of the sensor one. When the script is in “show min/max” mode by short pressing [MENU] the custom sensor panel will show min or max values depending on the “min or max tracking” option defined in the lua configuration file. Is the “2-nd screen” coming to Horus ? EDIT: don’t mind the cell colors, warning and critical levels where not set! What do you think of the Jumper? I worry they have priced this so low that they have not left enough margin for support of their OpenTX fork. FrSky’s support of OpenTX seems to have left them very vulnerable to this sort of ultra aggressive competition. I guess it is good if they raise their game but I just do not see them putting much into OpenTx if another company will just fold it into their fork. I wonder where this goes – not wanting to derail this thread. And I just received a Horus X10S! Personally, I’d not worry much about Jumper, they have forked a mature project and maintenance is going to be minimal.